Let me tell you a little bit about myself. My name is Galena, my blog is http://galena365.blogspot.com/ I was born and raised in Croatia until I met my husband, an American. We decided to live and raise our family in America (although that decision is getting reevaluated daily). In Croatia, the approach to school/ daycare lunches is very different from the U.S. and that’s why I offered to Mrs. Q to interview my mom, a daycare principal, in Croatia. Tell us about how your daycare is financed? The founder and owner of the daycare is the local government and it’s financed from two sources: local government budget (70%) and parent payments (30%). Current price per child is 1700 kuna/ 340$ monthly which makes up the total yearly budget of cc 1.450,000kuna / 290 000$. That budget has to cover pay + benefits for 14 employees, educational materials, food, utilities and everything else you might need in a daycare. What is the current number of children in the daycare? Our daycare has 3 classes: nursery (1 -2 year old), younger group (3- 4 year old) and the older group (5 – 7 year old). According to the bylaws the nursery should have 14, younger group 20 and the older group 25 children. However, the real situation is that we have 17 in the nursery, 28 in younger and 35 in the older mainly because of parent/ voter pressure and lack of space in the current building. We are obligated to provide 4 meals during a 10 hours stay. Those meals include: breakfast, lunch, snack 1 and snack 2. We are also obligated to provide fresh or dry fruit in the room throughout the whole day, available for the children to take when they feel like it. What is the meal structure? The menus are created by a 3 person body (cook, principal, a health counselor). Some of the more general guidelines are: white meat instead of red, fish at least once a week, dairy products daily, multi-grain or wheat bread (NOT white). There is insistance on seasonal fresh fruits and vegetables instead of frozen stuff. These are the guidelines from the Ministry of Health that all daycare centers in the country have to follow. Because of these guidelines we buy basic products and “enhance” them. For example, we purchase plain yoghurt and use it as a base to make fresh fruit yoghurt using fresh fruits and honey. We also make our own cream cheese using fresh cottage cheese and butter as base and adding vegetables (shredded carrots, broccoli, radishes or onions) or adding meat products to make pate (fish, tuna or bacon). Galena: Pate on bread with tea is one of the more typical breakfasts in Croatia. The only foods we don’t make from scratch are fish sticks because of the choking hazard i.e. bones. Everything else is prepared from scratch, including the soups. We cannot bake cakes because of the kitchen size so we include dry cookies (Galena: like plain animal crackers) and milk. We try to use honey as much as possible. Whenever we have ground meat we prepare it with 50% meat and 50% soy. The soups are always filled with seasonal vegetables with the addition of barley, lentils, chick peas, beans or peas. The daycare has one cook responsible for preparing about 70 meals a day. The cook also brings the food to each room on a trolley; she is in charge of cleaning the tables before the meal and taking the dirty dishes away. Mrs Q: I blacked out the kids’ faces because their parents did not give permission for the photo. They look like robotic, identical quadruplets so I hope that protects their identities! The teachers are in charge of serving the food although self- serving is encouraged with kids as young as two (as much as possible). I forgot to mention earlier that kids drink tea and milk for breakfast, and water for the other meals. The only juices allowed are the non-carbonated ones and those only for birthday celebrations. We have a special program working with the parents, trying to educate about healthy nutrition and we’re quite disappointed with the parents’ attitudes. Most children eat different tasting (Galena: more processed) foods at home so we have to use a bit of trickery: we call our broccoli cream cheese the “Ninja turtles’ food”, our strawberry yoghurts are “Barbie drinks”, buying silly straws for the yoghurts… whatever we can do to get them to eat. Out teachers are persistent and the children are slowly getting used to “new” foods. Some of the children’s’ favorites are lettuce, carrots, celery salad as well as green/ red cabbage combo salad. Amazing. 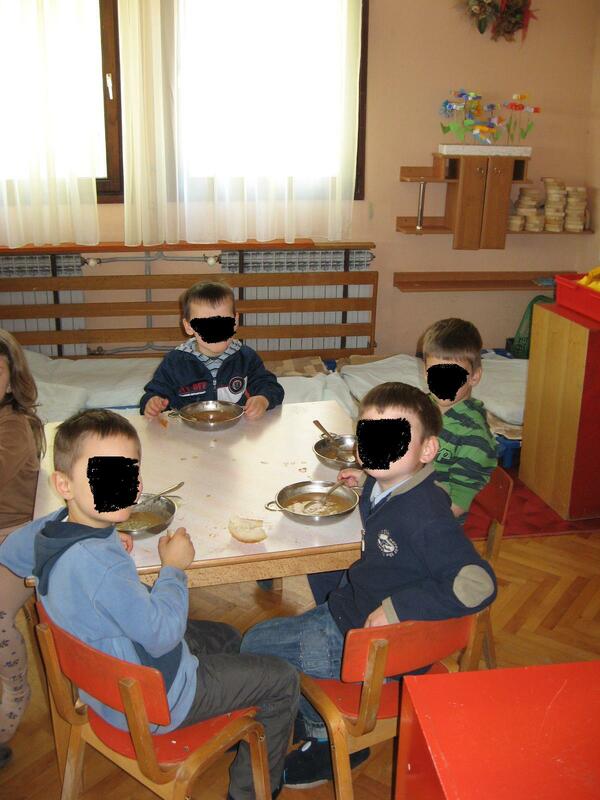 The USA's GDP is over 200 times that of Croatia, and our kids get stuck with crap while Croatian kids are eating locally-prepared food packed with veg and whole grains. That's a really misleading figure. Of course the USA's GDP is bigger. It's a much bigger country. A better comparison would be GDP per capita. In that case the USA's GDP per capita is "only" 3 times larger than that of Croatia. I need to marry a Croatian man and get up outta here! My only concern would be the 50 meat/50 soy mixes, as we don't eat soy products in my house. Other than that, Croatians have it good! It's interesting to hear about school meals in a country where the Industrial Agriculture business isn't making the rules. And look- they use real silverware. Not a plastic spork. I love these glimpses into other countries! What a great job they are doing for the kids! It's so rare to hear things about Croatia, and every time I do, I feel pretty proud! (I'm Croatian by the way). I think their system for the day cares is really good and wish we had something like that over here! What I think is interesting is the portion sizes. I think many kids around here would still be hungry after a slice of bread with butter and milk for breakfast. i find it interesting that many of these foods wouldn't even be allowed in daycare/preschool in the US due to possible toxins (honey) and food allergies. and yet – the US has a higher rate of child allergies. I'm fairly sure (without much science about it to reference, sorry), that processed food and pesticides account for a large chunk of the milder allergies and irritation. I intentionally avoid certain foodstuffs entirely, as for example the pesticides used on industrially grown tomatoes give me a very embarrassing rash around my mouth. It seems to be that children who eat local products with an emphasis on, if not organic, then at least environmentally sensibly grown food. This means that pesticides aren't used as a standard, only when needed, as are fertilisers. My food philosophy comes down to a simple rule: Let's face it, a child of four is hyperactive enough without caffeinated soda. And then we wonder why ADHD is on the rise. I rely on dark bread when I can get a hold of it, so I hope I'm doing *something* right here.